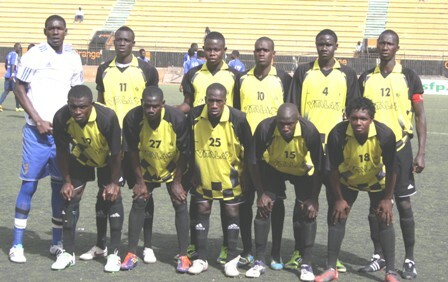 Dakar Université Club, mostly referred to as DUC, has impressed me during the Ligue 1 2011-2012, ending the season as number three in “Poule A”. DUC, a club with limited resources, won 50 percent of their matches and was only one point away from reaching the final stages. Before the current season, DUC lost their brilliant goalkeeper Ousseynou Ndiaye to Touré Kunda. Their new goalkeeper, Aziz Dramé, has done well, conceding a maximum of five goals during his 8-11 performances. El Hadji Abdou Sene or Alioune Badara Diedhiou is backup goalkeeper. Central defender Mansour Badji is often captaining the team and the experienced strongman is remarkably consistent in his performances. Just like last season, Badji was partnered by the rock-solid Souleymane Sadio. Diarga Fall has been a key player the last couple of seasons but played less then 50 percent of the matches this season, perhaps because of injury. Youssoupha Koné is another regular defender, most likely playing at right-back. I am not sure but I also believe Fadel Fall is a full-back, alternatively a midfielder. Pape Amadou Cissé is a key player in midfield, primarily with defensive responsibilities. Nigerian midfielder Johnson Nwachukwu is a tough, hard-working, defensive midfielder who has done well since joining the club. Jean Remy Bocande is a creative attacking midfielder or winger. Together with playmaker Cheikhal Ababacar Cissé and Babacar Niang, Bocande is one of the most dangerous attacking weapons of DUC. Famara Mané is a promosing midfielder, often found on the wing. Abdoulaye Touré, who scored eight league goals during the Ligue 1 2010-2011, had a disappointing season. The picture of DUC was found on thianlt.blogspot.com.